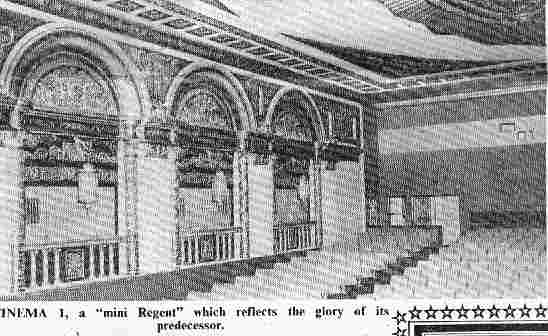 The Regent Theatre in Queen Street opened on Friday, 8 November, 1929. "When we saw the Wintergarden finished, we thought the last word had been said. 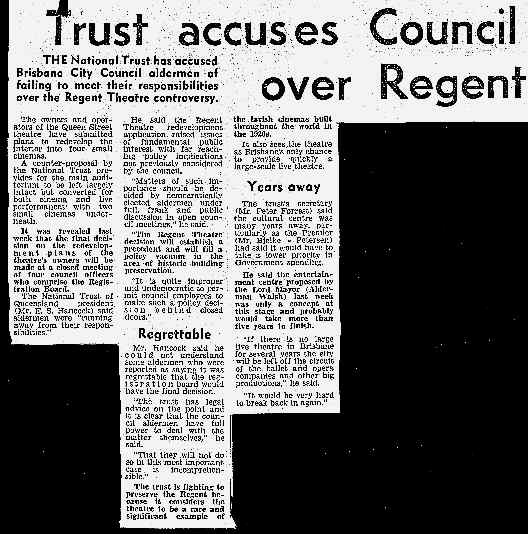 Now, will the Brisbane Regent ever be outdone?" 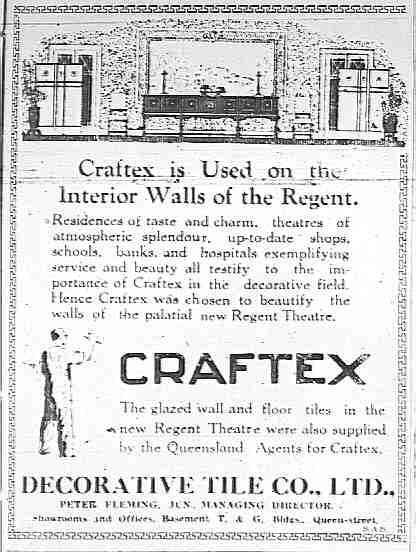 The Brisbane Regent was the last of Hoyt's great chain of mainland state capital city Regents. There is little space here to do justice to the magnificence of this building, with its Gothic foyer and French-style auditorium. Suffice it to say that it was probably the finest entertain-ment building ever constructed in Queensland, and its subsequent almost total loss is a matter for regret by those who value Queensland's heritage. 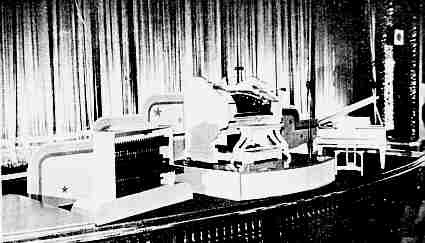 It incorporated the results of all the experience gained with the earlier Regents (the prototype was the Regent, South Yarra, Melbourne, built in 1925), and its auditorium displayed a quality and stylistic unity unsurpassed in any of the others. 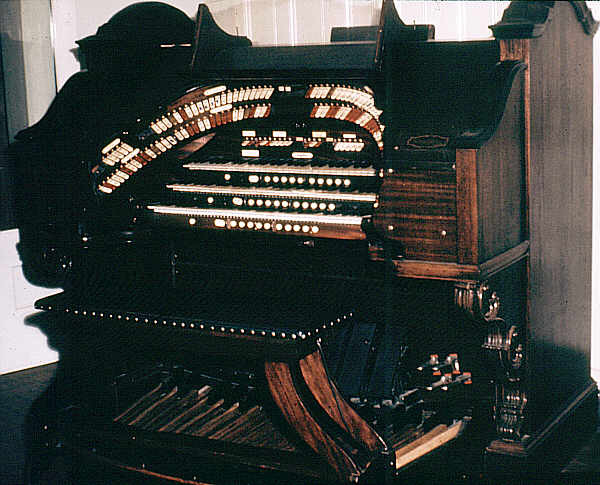 Its organ was a Style 260 Wurlitzer, with three manuals and fifteen ranks of pipes in two chambers on either side of the proscenium. The solo chamber housed a Trumpet (with brass resonators), Tibia Clausa, Kinura, Orchestral Oboe, Saxophone (again with brass resonators), String, Oboe Horn, Quintadena, percussions (excluding the Chrysoglott) and effects. The main chamber contained the pipes of the Diaphonic Diapason, Tuba Horn, Clarinet, Viol d'Orchestre, Viol Céleste, Flute and Vox Humana, plus the Chrysoglott. There was also an unenclosed grand piano playable from the manuals and pedals. 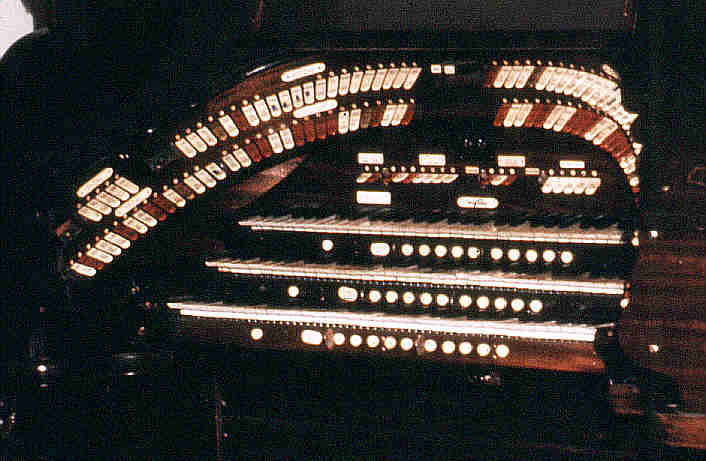 Style 260 was one of Wurlitzer's finest and best-selling models for larger theatres, and several examples had already been installed in Australia. 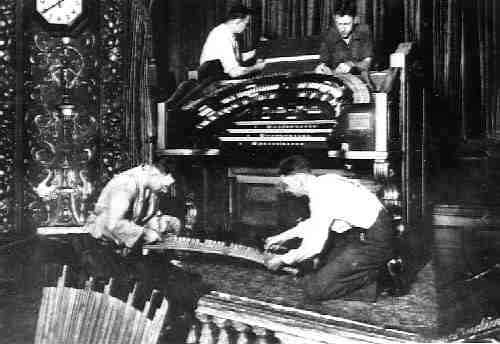 The Brisbane instrument is of historical interest in that it was the last new Wurlitzer organ to be sent to Australia. It left the factory on 11 March, 1929, as Opus 2040. 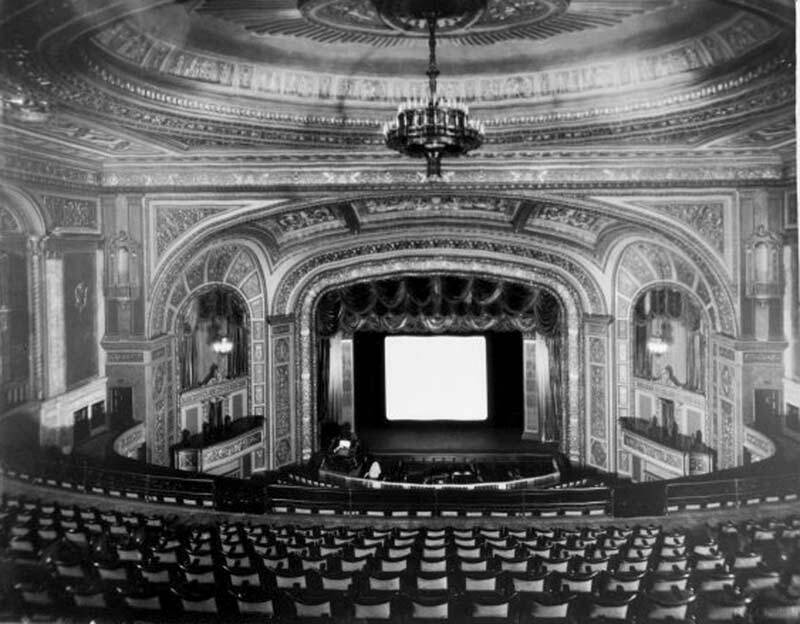 It had the only three manual "French" style console in Australia, with elegant curved side pillars, and another unusual feature was that its console was placed on an electrically operated lift, rather than the hydraulic type found elsewhere in Australian theatres. 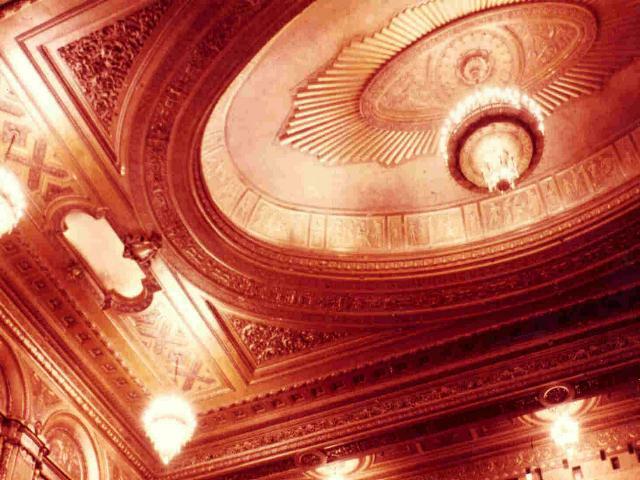 Such was its power that when it was tested prior to the opening of the theatre, it caused small particles of the ceiling to fall, and the opening of the theatre was slightly delayed while this was put right. Well before the opening of the theatre there was much press interest in the new organ, and photographs appeared showing the console and the procession of ten cart-loads of crates of parts comprising the instrument, which toured the city. It was said to comprise 120 tons of parts and to have cost £25,000. 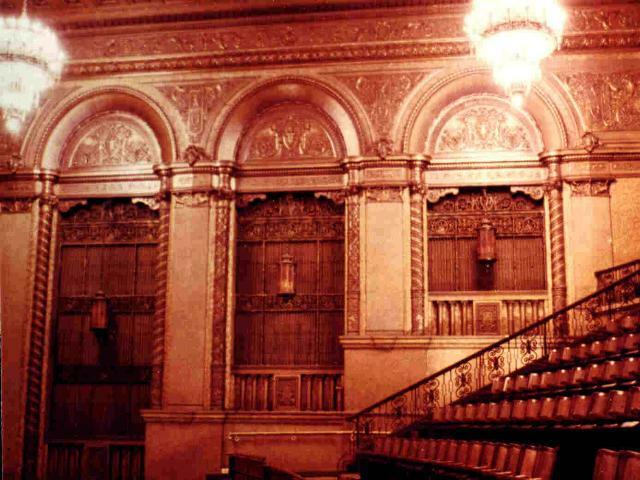 The twelve huge wooden pipes of the 32-ft. octave of diaphones, located above the ceiling of the theatre, weighed over 10,000 lbs., necessitating a specially reinforced steel structure. "... a tribute to the enterprise of the Fox Film Corporation, whose attractions are full of novelty. 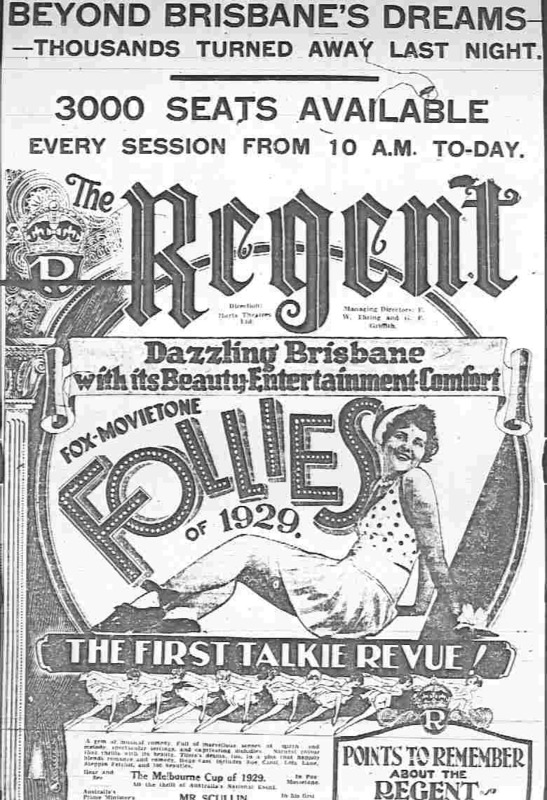 The featured attraction, 'Fox Follies of 1929', is the first talkie review to be presented to Australia. It shows that the talking screen can still compete with the legitimate stage, as the screen is without limit. 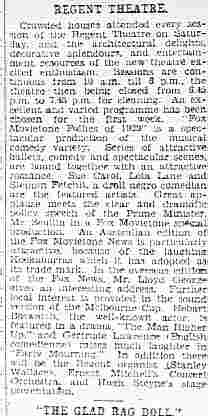 The first 'talkie' made by the Prime Minister, Mr Scullin, is also included, the film having been made immediately after his election. 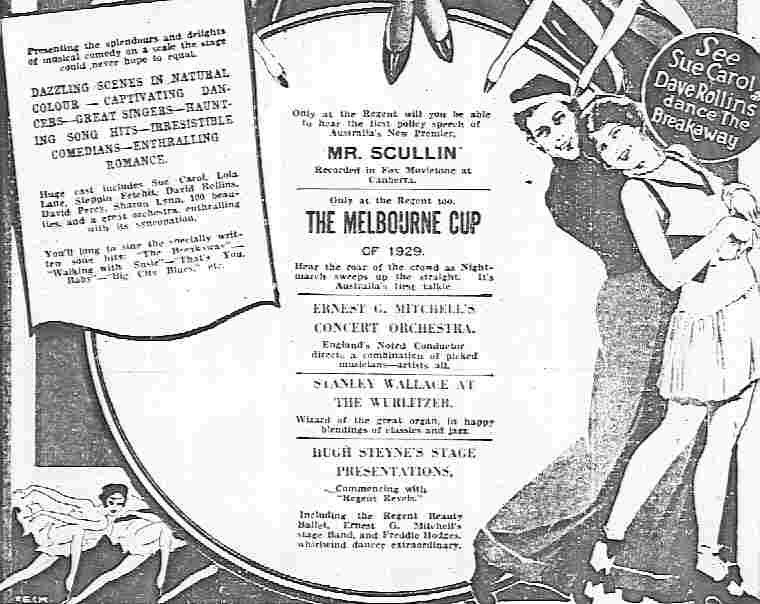 Then there is the 'talkie' of the Melbourne Cup of 1929, in which the Movietone camera recorded the thud of the hoofs and the roar of the crowd as Night March swept up the straight to victory. Musically, the programme is a strong one. 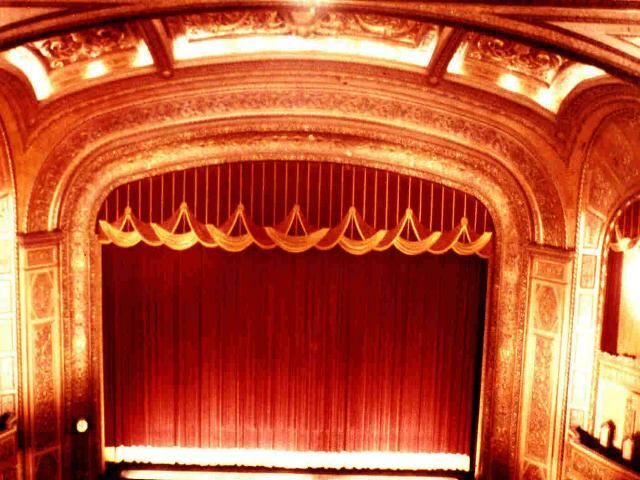 The Regent Grand Orchestra, under the direction of Ernest G. Mitchell, is to be heard in operatic selections. 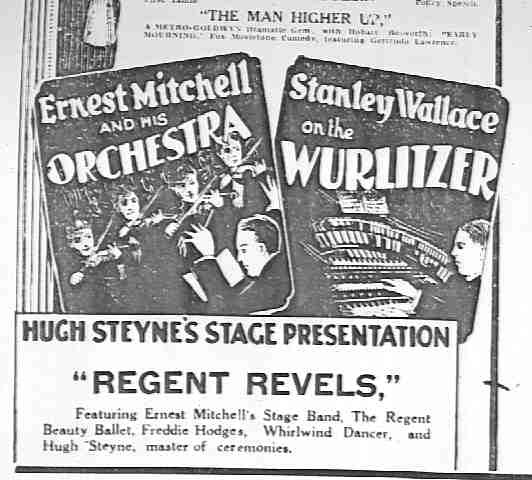 The American organist, Stanley Wallace, at the Wurlitzer, is already popular through his radio concerts. The stage presentations produced by Hugh Steyne will include a ballet of 12, the Regent Stage Band, Freddie Hidges, speciality dancer, and Hugh Steyne himself as master of ceremonies." 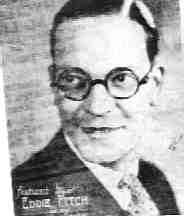 Stanley Wallace's contribution was advertised as "happy blendings of classics and jazz". 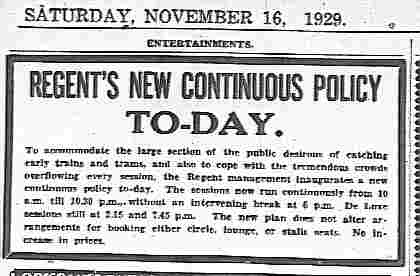 So popular was the 2583-seat house that from 16 November, 1929, a policy of continuous performances was announced. In the opening publicity, the organ was stated to have cost £30,000 - likely to have been a huge exaggeration. 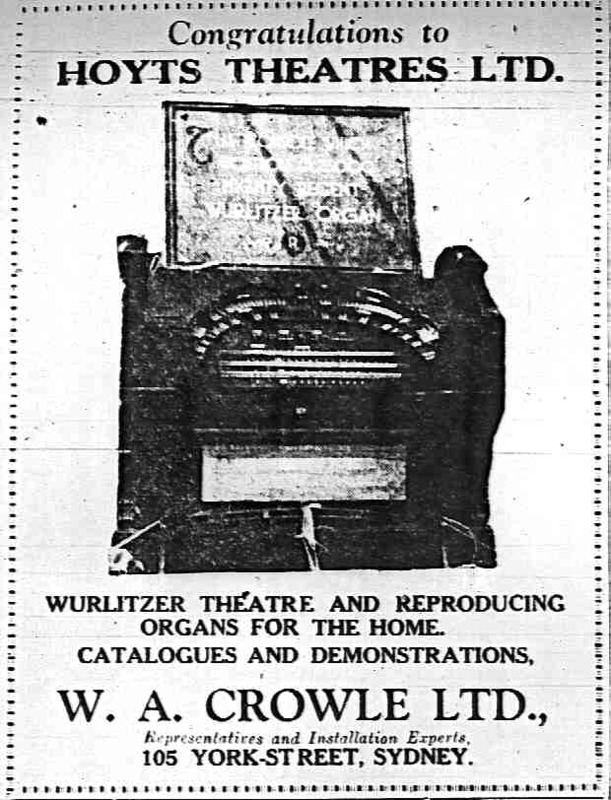 "His playing was not regarded as spectacular, but he was an excellent showman and capable demonstrator of the instrument and could put the Wurlitzer through its paces... In a later programme he played classics and jazz (as modern music was called in those days). He asked the audience which they preferred, and by a vote of acclama-tion they preferred classics... The writer will always remember Stanley Wallace seated at the rosewood polished console on a Saturday afternoon, dressed in a light brown sports blazer and cream tennis flannel trousers with a white panama hat resting on the console seat." Wallace was followed by Eddie Fitch, whose first performance was on 9 January, 1930. 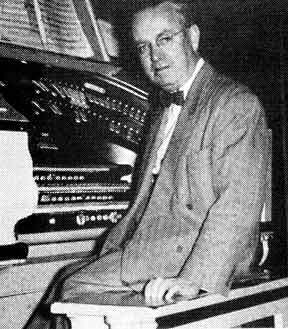 Edmund C. Fitch had made a name for himself in Chicago, where he played at the Roosevelt (1921), Stratford (1924), Colony (1927) and Sheridan Theatres, at the last of which he opened the four-manual twenty-rank Style Publix 1 Wurlitzer on 12 February, 1927. He broadcast over radio station WTAS (Chicago). "He had a remarkable understanding of the classics. He excelled himself in overtures." Eddie came to Australia to open the organ at the Plaza, Melbourne (12-rank Wurlitzer) and played also at the Regent, Melbourne. While in Melbourne he recorded a couple of 78 rpm record sides with a vocalist. He remained only a short while in Brisbane, as he moved back south to open the eight-rank Christie organ at the Plaza, Sydney, on 11 April, 1930. After Eddie Fitch came fellow American Eddie Ford, whose first performance at the Regent was on 2 April, 1930. 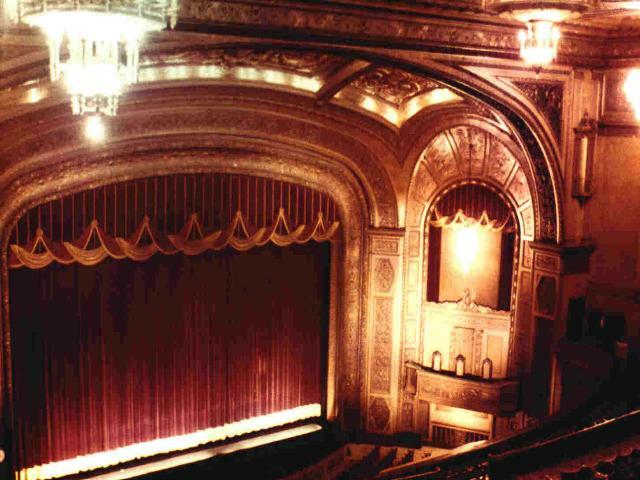 Edgar A. Ford, then aged 24, had commenced his career at the Roger Sherman Theatre, New Haven, Connecticut, USA, in 1926, and had subsequently held organist's appointments at the Tampa Theatre, Tampa, Florida, the Aztec Theatre, San Antonio, Texas, and the Roxy and Colony Theatres in New York City, before coming to Australia. For his début at the Regent he was billed as "New York's Wonder Boy" and "had done much to popularise community singing." He left Brisbane in December, 1930, and played at the Regent, Sydney, until 20 March, 1931, before returning to America for a ten-year residency at the Tampa Theatre, Tampa, Florida, followed by several other engage-ments, including the four-manual, forty-two-rank, Möller organ at the Fox Theatre, Atlanta, Georgia (1952-53). 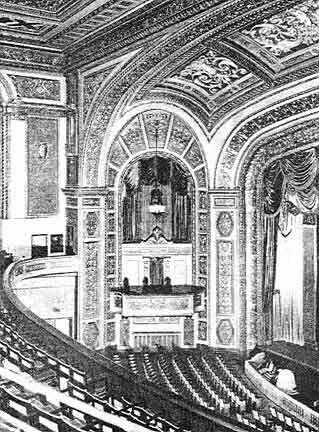 When Eddie Ford left the Regent, his place was taken by Wallace Kotter, yet another American, who had been organist at the United Artists' Theatre, Chicago, prior to coming to Australia to open the second Wurlitzer at the Regent, Sydney, in March, 1929. 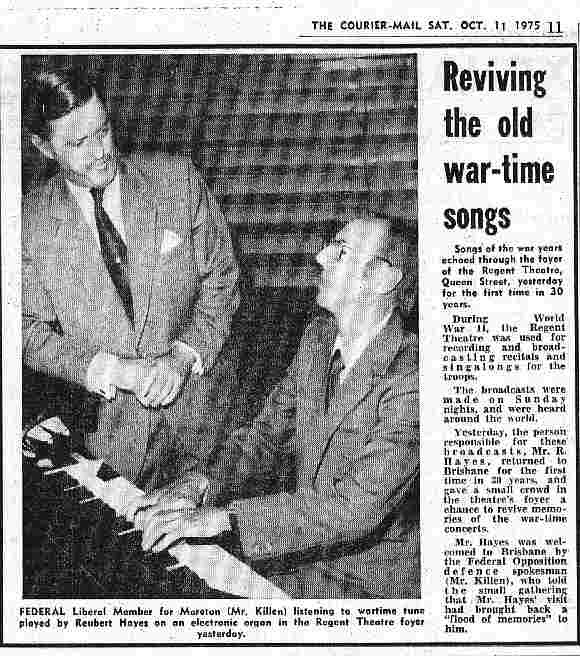 He also played for a while at the Regent, Adelaide (fifteen-rank Wurlitzer). His opening performance in Brisbane was on 9 December, 1930. Kotter remained at the Regent for some years, and, as at the Sydney Regent, he is the best-remembered of the American organists. "Wallace was a reasonably good organist, but loved to make the organ roar... Many times when loud passages were played on the organ, the lanterns in front of the organ chambers swayed ever so gently, and the huge crystal chandelier in the ceiling would sway. The crystal pendants would also vibrate in unison with the organ." Kotter introduced an unusual act in May, 1931, featuring duets at the organ console with Ellie Jones (soon to become organist at the Wintergarden Theatre), billed as "Me and the Girl-Friend". He also played the five-manual Willis concert organ in the City Hall for community singing. The next organist was Les Richmond, who had been pianist in the Regent orchestra on opening night and had graduated to the position of relief organist, studying the organ under Eddie Ford. Les frequently broadcast the organ. 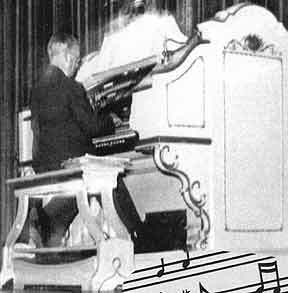 Reubert Hayes, from the Melba Theatre, Strathfield, Sydney (eight-rank Christie organ) and the Victory Theatre, Kogarah, Sydney (seven-rank Christie organ), was appointed resident organist in 1939. He is best remembered for his weekly sing-a-long broadcasts during the war years. 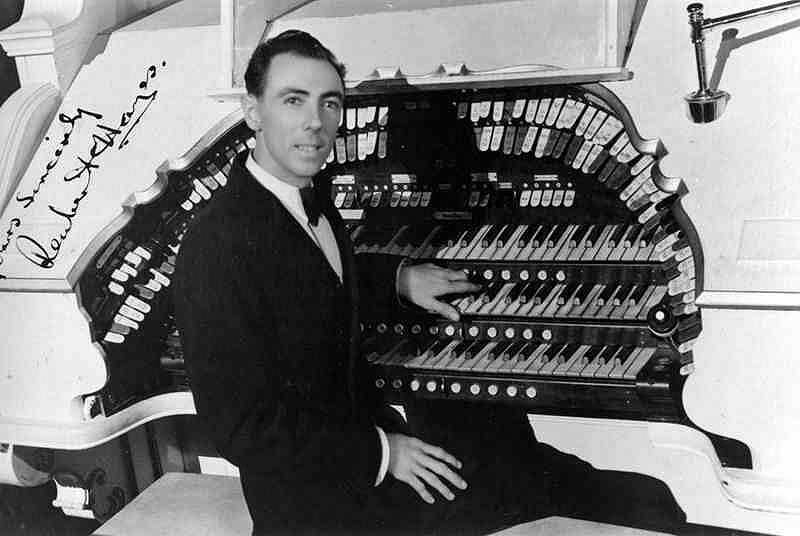 Les Richmond remained as associate organist (the orchestra was disbanded in 1943), and was reappointed resident organist in June, 1946, when Reubert Hayes returned south to the Plaza, Sydney, to play the organ formerly in Brisbane's Wintergarden Theatre, which had replaced the Plaza's Christie organ in 1938. 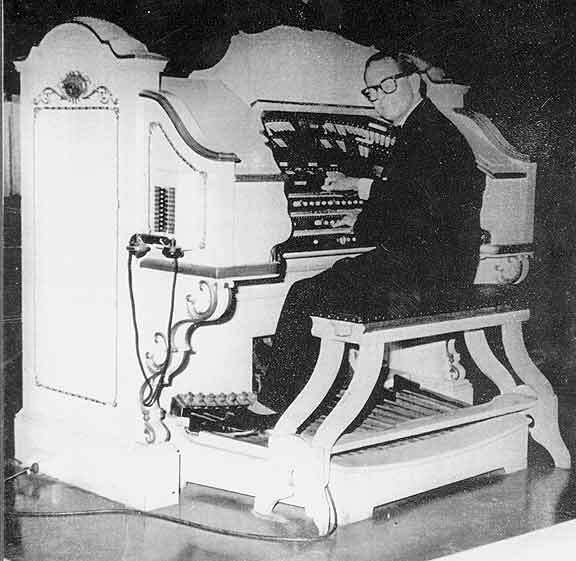 Les Richmond remained as organist until regular use of the organ ceased, and still continued to play it from time to time until the final public performance, for the Theatre Organ Society of Australia, in November, 1963. For that final concert Les was joined by Stephen Smith, Peter Johnstone and Rod Blackmore. 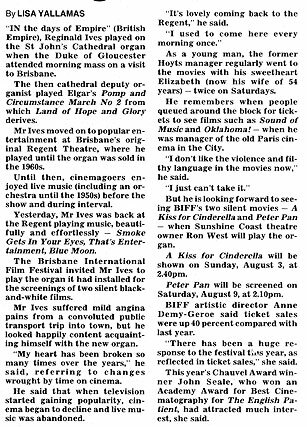 Another organist who played the Regent organ during its later years was Reg Ives, who had been deputy organist at Brisbane Cathedral. The organ was the dismantled and removed to the residence of Dr Keith King in Lawson, NSW, where it was re-erected and remained in playing order for the next forty years. In late 2003, it was announced that the organ would be returning shortly to Brisbane, to the Queensland Gallery of Modern Art, at South Bank. During the war years, the organ console (by then painted white) was moved to the centre of the pit, on the orchestra lift, flanked by the Chrysoglott and the white-painted grand piano attachment, on the left and right, respectively. Subsequently, the piano was moved to the small lift at the left of the pit, on which the organ console had originally been placed, and the Chrysoglott returned to the main organ chamber. 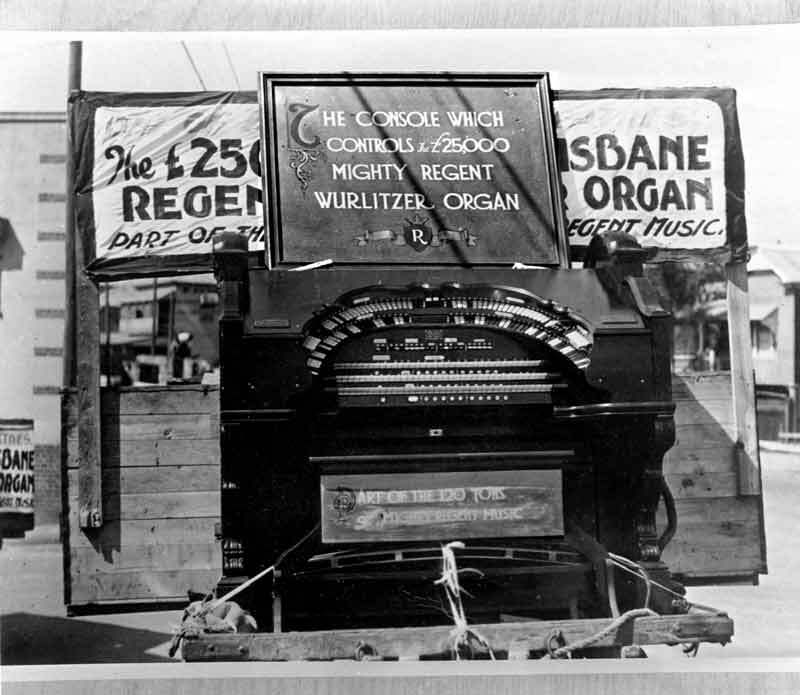 The specification of the Regent organ differed in minor respects from Australia's other Style 260 Wurlitzers. It had a wider range of couplers and the Tibia rank was extend-ed higher, to make it available at 2 2/3 and 2-foot pitches. It also had an additional balanced swell pedal to control the expression and sustain mechanisms on the grand piano attachment (the piano would have had up to sixteen stages of expression controlling the force with which the hammers struck the strings). Control of the shutters of the main and/or solo chambers could be transferred to this pedal by means of switches. 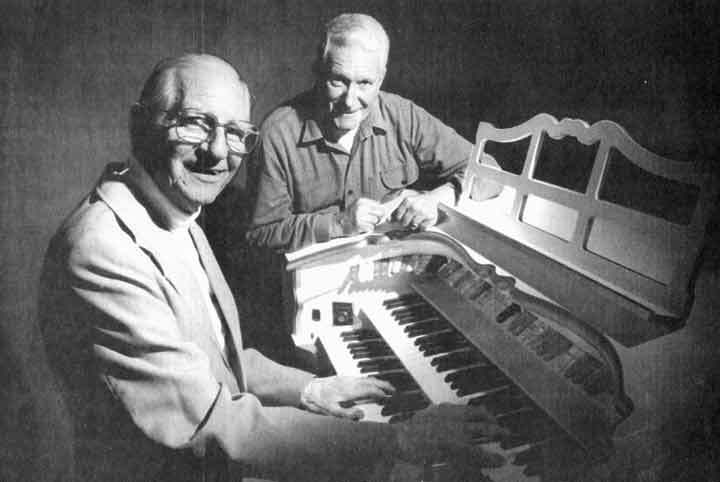 Reubert Hayes returned to the Regent in October, 1975, when he played a Conn electronic organ in the foyer to publicise a record modelled on his war-time sing-a-long broadcasts from the theatre. 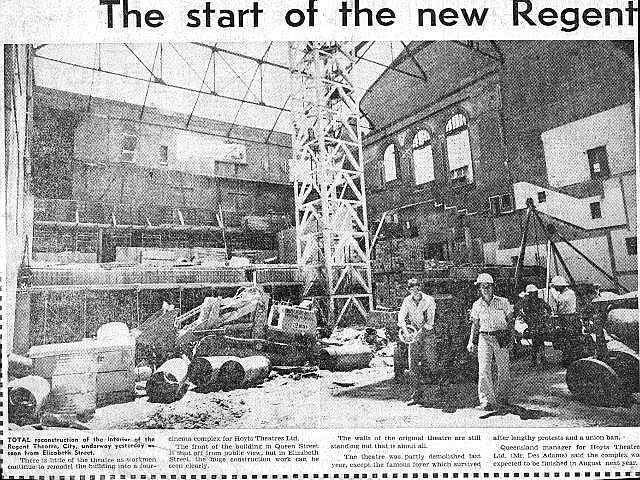 The Regent Theatre outlived its organ by some fifteen years, but all except the lobby was gutted in 1979, despite vigorous efforts to save the theatre. 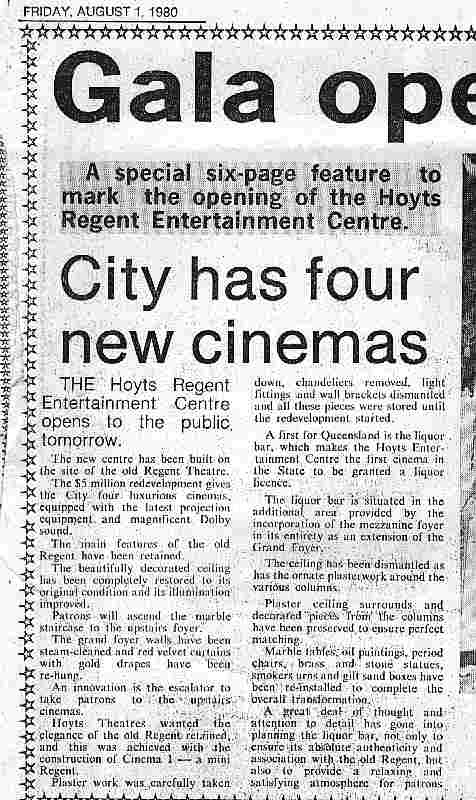 On Saturday, 2 August, 1980, Hoyt's Regent Entertainment Centre was opened, comprising four small auditoria approached through the original lobby. 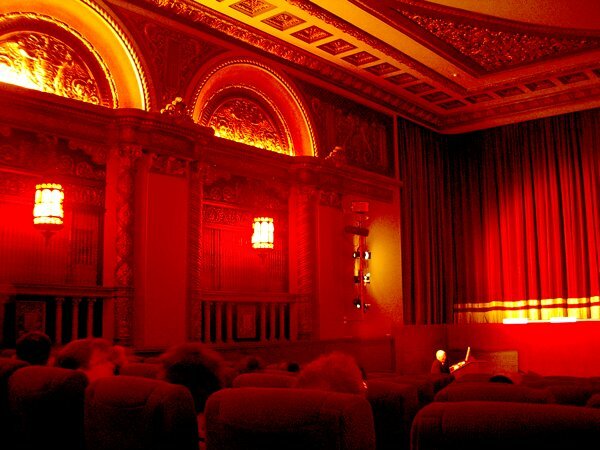 "Cinema 1" was designed as a "mini-Regent", and incorporates some plasterwork and fittings salvaged from the original theatre. Wilbur Kentwell played an electronic organ for the reopening occasion. 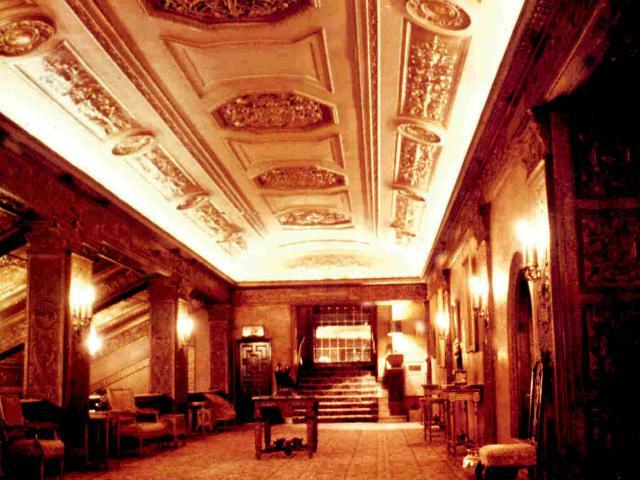 In 1997 Reg Ives made a brief return visit to the Regent, where he joined Ron West from the Majestic, Pomona, to play an electronic organ for the Brisbane International Film festival.